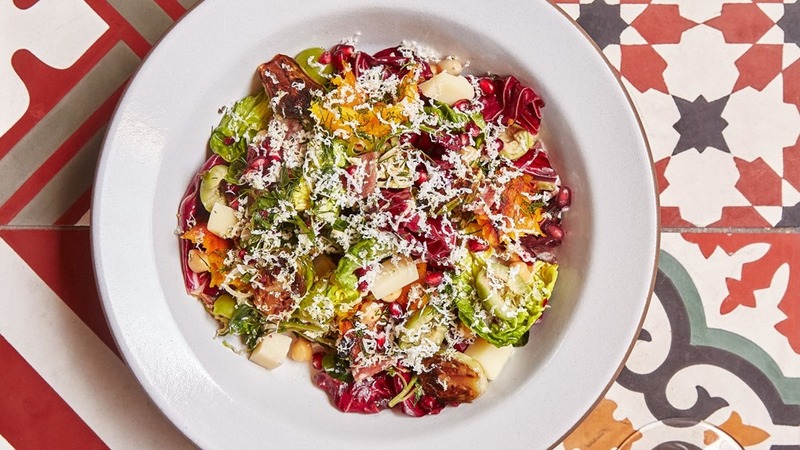 This wonderful chopped salad is from Che Fico in San Francisco. I have adjusted it to be healthier and dairy free. and pepper. Roast until very tender, about 11/4 hours. Watch very carefully, due to the honey it can burn very quickly. Let cool. coat. Cook just until vinegar and butter form a glaze over sprouts. Let cool; discard herbs. grate in garlic and whisk to combine. Let sit 15 minutes. until oil is warm but not yet sizzling. Add remaining ⅔ cup oil to cool down infused oil. Do Ahead: Vinaigrette can be made 3 days ahead. Cover and chill. Toss scallions, salami, olives, and dill. Scoop out bite-size pieces of roasted squash until you have 2 cups; save remaining squash for another use. Add to mixture along with Brussels sprouts and glaze. Add radicchio and lettuce and toss to combine. Add more vinaigrette to taste; season with salt. Serve salad topped with pomegranate seeds.